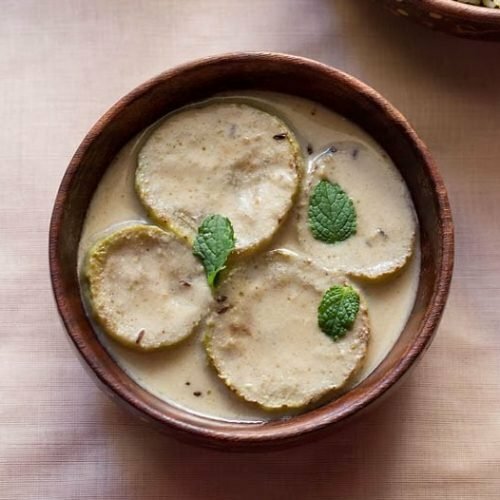 lauki yakhni or al yakhni is a gravy dish with fried bottle gourd slices in a light and aromatic yogurt sauce. heat oil in a flat pan. pan fry the lauki slices till they are browned and cooked well. in the same pan or in another pan, heat oil. if there is leftover oil, then just add some extra oil to the same pan so that it becomes approx 1 tbsp oil. add the whole spices - shahjeera, cinnamon,black cardamoms and fry till the oil becomes aromatic. now switch off the fire and let the pan stand for 1-2 minutes if its very hot. be careful when pouring the water as if the oil is very hot, the oil will splutter. add the fried lauki slices, ginger powder, fennel powder, asafoetida and salt. simmer for 2-3 mins. slowly add the whisked yogurt and continue to stir while adding. simmer for 4-5 minutes or till the sauce thickens a bit. serve the lauki yakhni with some steamed basmati rice or saffron rice or kashmiri pulav.